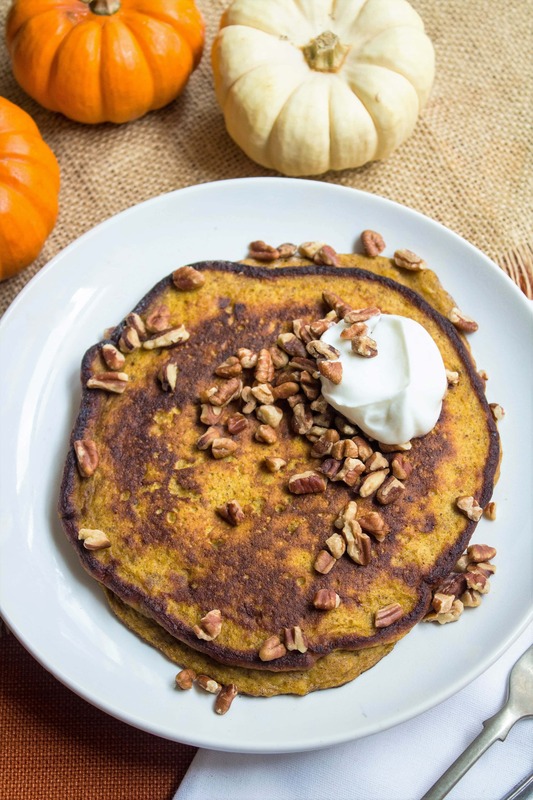 Gluten Free Spiced Pumpkin Pancakes! 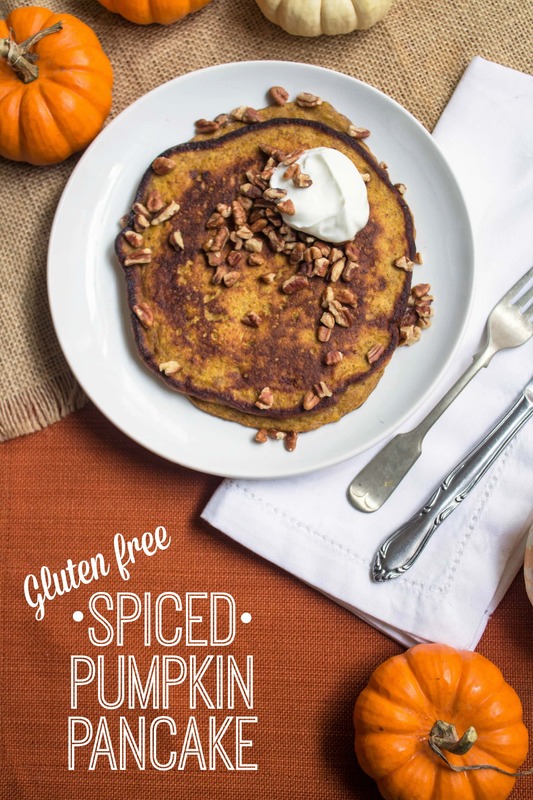 A fun seasonal variation on my old fave flour free protein pancake. You’re welcome. 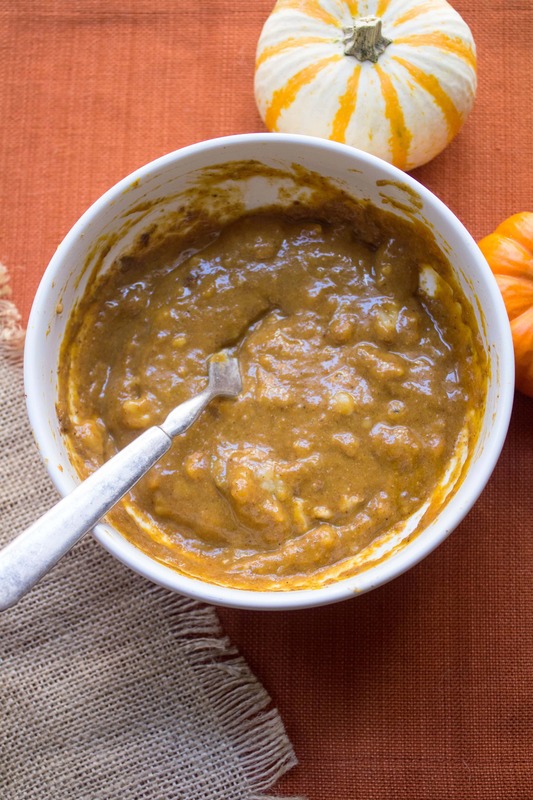 With the exception of occasional appearances in my Pumpkin Pie Oatmeal, pumpkin hasn’t gotten as much love on this blog recently as it did in previous years! It was time to change that. 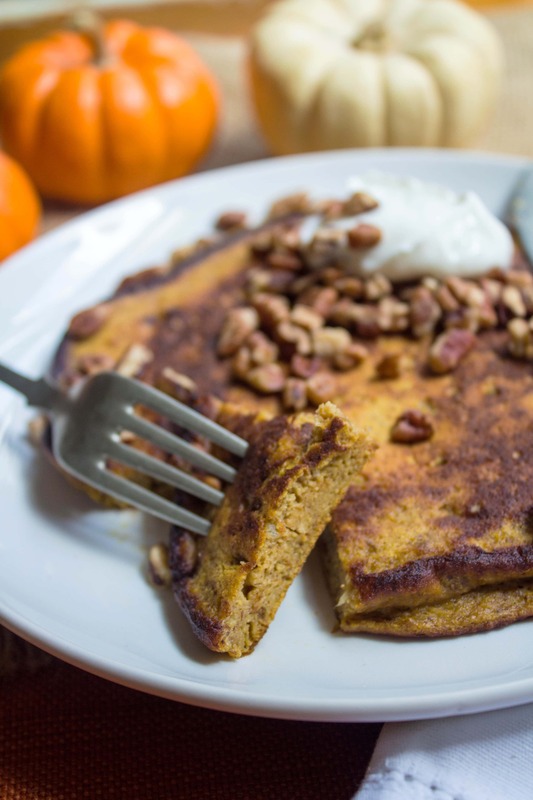 This recipe restored my love for pumpkin and for sneaking vegetables into breakfast. All is right again with the world. Combine all above ingredients in a bowl (mash the banana first unless you want a big mess) and mix until somewhat uniform. Then, pour the mixture into a small pan (an omelette sized pan works best — be sure to grease it first) over low heat. Let the pancake cook untouched about 10 minutes, or until it starts sizzling and the pancake is firm enough to flip. Cook another minute or two on the other side, then serve and enjoy! I love topping mine with fresh blueberries and/or some plain yogurt (pictured) – no syrup needed! This pancake is best enjoyed with a latte by its side… and while still in your PJs. 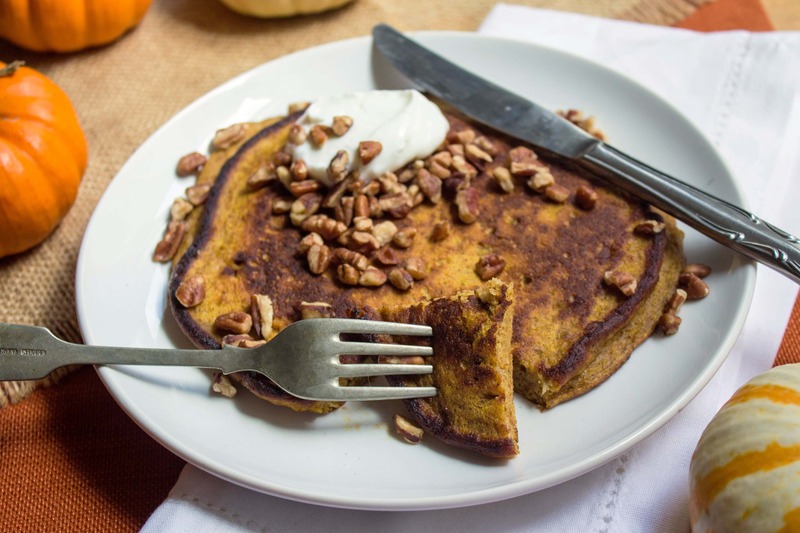 If you like this recipe, you’ll love my High Protein & Flour Free Breakfast Pancake, too! Also: give my Paleo Pumpkin Muffins a shot! What’s your favorite kind of pancake? Here are more recipes to try: Healthy Pumpkin Recipes. That looks like your table from the patio! Are ya crazy??? Too cold … even with pancakes and a latte!!!! Haha I certainly didn’t eat out there! I took pictures for 5 seconds and then went right back inside. :) The lighting inside our apartment is just atrocious for photos so if I want good ones, it needs to be on the patio! I love pumpkin anything. It has the most comforting taste. I will try this recipe this weekend. Thanks much. Definitely trying this! I try to be gluten free so I can’t wait. Have everything I need but the pumpkin so I am putting it on my grocery list. Thanks! This would be great on a crisp fall morning! Looks great for a snowy Saturday morning! NOM. I’m a-gonna try to veganize this! I really want to test out this type of pancake recipe cause I’m a pancakeaholic BUT I dont like the taste of bananas in bread (I know its weird). Can you taste the banana at all? You can definitely taste the banana! Sorry! I can’t find the recipe that you posted about adding pumpkin to oatmeal so I am sticking this in here. I added 1/2 can of libby’s pumpkin at the end of the cooking of my steel cut oatmeal (4 servings). I served it with fresh ground nutmeg, cinnamon and 1 tablespoon of raisins. My husband added nuts. It was amazing. So thank you for that suggestion. I am going to make the pancakes tomorrow. Yum – glad you liked it! I attempted to make these this morning but failed big time. After about 8 minutes I tried to flip the pancake but it was stuck to the pan and ended up being a total loss. Bummer! I’m sorry to hear that! I always put a little cooking spray in the pan before I put in the pancake mix – did you do that? This looks so yummy – I haven’t had a pancake in years! Do you have any recipes with Almond Butter? I have Justins Maple Almond Butter right now and feel like it could make a great gluten-free pancake?! I LOVE pancakes of almost any kind. 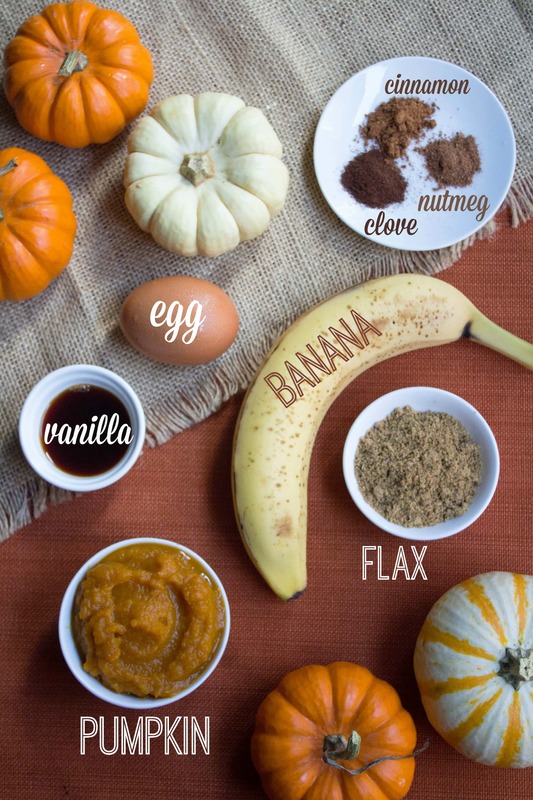 My favorite is actually similar to yours, but I sub out the eggs and banana with no sugar added apple butter, and pumpkin:) I also use coconut flour to thicken it as well, which makes it super fluffy and cakey:) Thanks for sharing this recipe! :) I love your blog! Thanks for reading! Your version of the pancakes sounds great, too – yum! I tried making these this morning but I was not quite successful. Maybe it is because I used home -made pumpkin puree instead of canned. But these pancakes where very hard to flip (I tried both large as well as small pancakes) and really where more like omlette-scrambled egg than a pancake. But I love the basic idea so next time I might try adding some sort of flour. I’m sorry to hear that! Try using an omelette-sized small pan — mine is 8″ and that makes it nice and easy to flip! Ah, that is a fabulous tip! Yes, I will give that a try!